We love spicy foods here at Bittermens. In fact, habaneros appear in everything from cream sauces to omelets at home. However, we have found that when people try to make spicy cocktails, much of the time the flavor falls short. The problem as we see it isn’t the heat – it’s how the heat is incorporated into the cocktail. Infusing jalapeño peppers into tequila is perfect if you want a tequila drink. 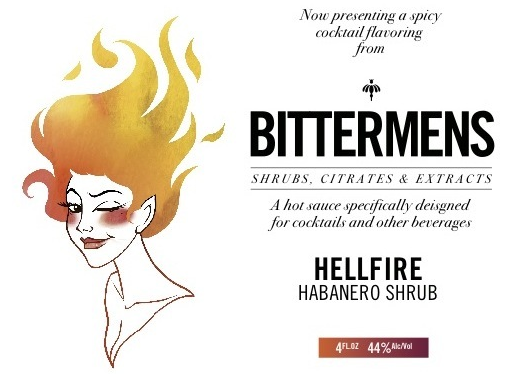 However, simply putting commercial hot sauces, sambal or sriracha into a cocktail usually throws off the cocktail’s balance. We’ve fortified the shrub with alcohol (to better extract the flavors from the spices) and made it much more concentrated, so you only need to use drops instead of ounces to get the desired effect… which, in this case, is a good ol’ bit of heat.